We’d love your help. Let us know what’s wrong with this preview of 100 Plus by Sonia Arrison. Humanity is on the cusp of an exciting longevity revolution. The first person to live to 150 years has probably already been born. What will your life look like when you live to be over 100? Will you be healthy? Will your marriage need a sunset clause? How long will you have to work? Will you finish one career at sixty-five only to go back to school to learn a new one? And Humanity is on the cusp of an exciting longevity revolution. The first person to live to 150 years has probably already been born. What will your life look like when you live to be over 100? Will you be healthy? Will your marriage need a sunset clause? How long will you have to work? Will you finish one career at sixty-five only to go back to school to learn a new one? And then, will you be happily working for another sixty years? Maybe you’ll be a parent to a newborn and a grandparent at the same time. Will the world become overpopulated? And how will living longer affect your finances, your family life, and your views on religion and the afterlife? In 100 Plus, futurist Sonia Arrison takes us on an eye-opening journey to the future at our doorsteps, where science and technology are beginning to radically change life as we know it. She introduces us to the people transforming our lives: the brilliant scientists and genius inventors and the billionaires who fund their work. The astonishing advances to extend our lives—and good health—are almost here. In the very near future fresh organs for transplants will be grown in laboratories, cloned stem cells will bring previously unstoppable diseases to their knees, and living past 100 will be the rule, not the exception. Sonia Arrison brings over a decade of experience researching and writing about cutting-edge advances in science and technology to 100 Plus, painting a vivid picture of a future that only recently seemed like science fiction, but now is very real. To ask other readers questions about 100 Plus, please sign up. After the exciting endorsements, great introduction, and strong recommendation by a trusted acquaintance, I ended up quite disappointed by this book. I was hoping for an interesting and enlightening intellectual discussion of how our individual lives and society as a whole will change as our lifespans increase, but instead found a name-dropping overview of the field written from a strongly biased point of view that kept trying to masquerade as unbiased education. In particular, I was hugely disa After the exciting endorsements, great introduction, and strong recommendation by a trusted acquaintance, I ended up quite disappointed by this book. I was hoping for an interesting and enlightening intellectual discussion of how our individual lives and society as a whole will change as our lifespans increase, but instead found a name-dropping overview of the field written from a strongly biased point of view that kept trying to masquerade as unbiased education. In particular, I was hugely disappointed by the lack of any real discussion about the changing nature of families and relationships. She presented medical research showing that we're making progress in fertility treatments, demographic research showing that divorce is rising, and some quick thoughts on how it's hard to have siblings far different in age from you or to blend pre-existing families together when parents re-marry. There was none of the (I thought) promised discussion about the psychology behind how we'll approach relationships when our adult lives are three times as long, and she entirely skirted any discussion of the 'free love' attitude portrayed in many sci-fi/fiction settings with longer lives and better health care. She gets much closer to what I was looking for in Chapters 6 and 7 (on finance and religion), adding her own ideas, using the word 'clearly' 10% as often, and providing an interesting glimpse forward into what might be. 2. Ms Arrison's writing style frustrates me. She treats her opinions as self-evident, and provides very little evidence to back them up - then assumes that the reader believed them to be well proved. (I would be okay with this cursory style if she didn't have the audacity to assume that her weak or non-existent arguments were sufficient to completely make the point to most readers, and instead made it clear that she knew that she was only explaining an idea, and then asking us to assume it was correct so that she could use it as a basis for future chapters.) She also breaks into needlessly unprofessional commentary at points, such as bringing the 'left' and 'right' alignment of researchers into a discussion in which politics are irrelevant, mainly or entirely for the purpose of suggesting that an idea is bad because it came from the 'right'. This is a pretty quick read; I got through it in merely 0.000054 of the days it suggests I may have in this life. She spends a few chapters quickly going over the reasons why it's not crazy to suggest humans may double their healthy lifespan (once again). After that, the bulk of the book runs through the effects such a lifespan may have on various aspects of self and society. While Arrison doesn't delve too deep into any particular area she does manage to consider a lot, from the economic to the This is a pretty quick read; I got through it in merely 0.000054 of the days it suggests I may have in this life. She spends a few chapters quickly going over the reasons why it's not crazy to suggest humans may double their healthy lifespan (once again). After that, the bulk of the book runs through the effects such a lifespan may have on various aspects of self and society. While Arrison doesn't delve too deep into any particular area she does manage to consider a lot, from the economic to the religious to the family structure. Great primer on the interesting problems that we will encounter due to the advances in anti-aging therapies. Focuses on moral, economic and societal issues. Very interesting and would be a good intro for people who are looking to get started in reading about such issues. I share the optimism of Arrison regarding the near future of human life extension. It is an idea whose time has not yet quite come. Once it does, there will be much political pressure to fund research to bring about human life extension. Her approach is similar to Michio Kaku. Just like his, I found her work very extensively studied. Many of the critics involve lack of in depth analysis. But this book is not for that purpose. It's presenting the future and its social implication from the existing trends. Of course, she needs to present wide range of topics. That sparks our imagination. Well done. 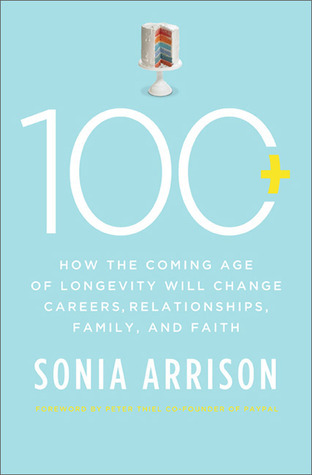 100 Plus: How the Coming Age of Longevity Will Change Everything, From Careers and Relationships to Family and Faith (2013) by Sonia Arrison looks at how likely dramatically extended lifespans are and what their consequences would be. Arrison is founder and is connected with Ray Kurzweil's Singularity University. The idea of dramatically enhanced, or even indefinitely enhanced longevity is really interesting. It's physically possible, it's plausible and there is even a trend, that of increasing 100 Plus: How the Coming Age of Longevity Will Change Everything, From Careers and Relationships to Family and Faith (2013) by Sonia Arrison looks at how likely dramatically extended lifespans are and what their consequences would be. Arrison is founder and is connected with Ray Kurzweil's Singularity University. The idea of dramatically enhanced, or even indefinitely enhanced longevity is really interesting. It's physically possible, it's plausible and there is even a trend, that of increasing life span that makes it seem quite possible. Indeed, in 2000 leaving India and spending a day in Bangkok I met a man who was about 40 and firmly believed that he was not too old too see such change, provided he kept himself in really good shape. Life expectancy has been rising for about 200 years but this has mainly been due to a reduction in child mortality and improvements in basic health. However recently various technologies are starting to promise a dramatic extension in longevity. The sequencing of human genome, AI and the increase in computing power and stem cell research are producing some incredible breakthroughs that may well lead to radical change. Growing replacement organs is going to happen, stem cell replacement and change of cells may well lead to huge change. The book looks at this and has a lot of interesting information about these technologies, however the book makes the assumption that these changes will happen. It's a big leap. While it may well happen it's far from certain. 100 Plus is an interesting read, it makes a big assumption that lives will be dramatically extended. This isn't completely unreasonable but it's important to note that book isn't about pondering how likely dramatic life extension is. The facts about the current changes in technology and the well thought through discussion of the consequences of life extension are well presented and most interesting to think about. This book might appeal to those who are already convinced that ageing is a worthy cause, but fails to provide a convincing argument for those who are yet to be sold on the idea. The book outlines a lot for research into life extension technology and seems pretty inspiring in this area, it does leave me feeling much more hopeful about the prospect of achieving radical longevity in the next hundred years. I came to this book looking for a more in-depth discussion of how radical longevity will affe This book might appeal to those who are already convinced that ageing is a worthy cause, but fails to provide a convincing argument for those who are yet to be sold on the idea. The book outlines a lot for research into life extension technology and seems pretty inspiring in this area, it does leave me feeling much more hopeful about the prospect of achieving radical longevity in the next hundred years. I came to this book looking for a more in-depth discussion of how radical longevity will affect society, how we will deal with resource constraints, population increases, changes to work, children, friendships and relationships yet was offered only token nods towards exploring these issues. Overall, an awkward, formulaic writing style combined with a failure to live up to the promise of the title left me feeling rather disappointed in this book. 100 Plus was a solid overview of the current state of the art in extended human longevity, as well as the potential impacts that longer lives will have on the earth and its inhabitants. One big impact that I hope extended longevity would have is that long term problems like climate change might be taken more seriously by a generation in power that might otherwise see it as unlikely to impact their lifetime. I bought 100 Plus because it was recommended by Peter Thiel in Zero to One. A partial expl 100 Plus was a solid overview of the current state of the art in extended human longevity, as well as the potential impacts that longer lives will have on the earth and its inhabitants. One big impact that I hope extended longevity would have is that long term problems like climate change might be taken more seriously by a generation in power that might otherwise see it as unlikely to impact their lifetime. I think this is a really important book that I completely picked up on a whim. I'm glad I did. This stuff is extremely relevant to us today at a time where the science for longevity is in desperate need of what Sonia calles "salesman" who are enthusiastic showcases of knowledge. Chock full of information concerning how different aspects of culture will be affected by this notion of living longer. Incredibly fascinating read full of thought-provoking data. Author Sonia Arrison does a great job of I think this is a really important book that I completely picked up on a whim. I'm glad I did. This stuff is extremely relevant to us today at a time where the science for longevity is in desperate need of what Sonia calles "salesman" who are enthusiastic showcases of knowledge. Not a lot of insight beyond what was in things like Wired Magazine (even at the time the book was released). I was expecting a bit more on the societal questions on how radical longevity might affect a modern civilization, and while these elements were certainty touched upon, it never went very far or posited anything interesting. The writing was very accessible, to its credit, but it wasn't much of a read, and if you haven't gotten around to this one (by 2016) I wouldn't recommend keeping it on Not a lot of insight beyond what was in things like Wired Magazine (even at the time the book was released). I was expecting a bit more on the societal questions on how radical longevity might affect a modern civilization, and while these elements were certainty touched upon, it never went very far or posited anything interesting. New technologies and progress in science are already providing us with ways to live much longer and healthier lives. As our life spans extend, this will have a huge impact on society and the way we approach our existence. However, humanity is creative enough and strong enough to deal with this, and we shouldn’t fear an aging, growing population. The tile for this book was more interesting than the contents. The author's main question was "what happens to society if life spans continue to grow". For example, what will families, medical care and retirement be like if the average person lives 150 years. The breadth of the book made it feel more like a general survey rather than an in depth exploration of an issue. Personally, I'd like to read more about the family when someone lives 150 years. I found this a very interesting look at the possibility of humans living beyond the age of 100. Because my husband was diagnosed with Parkinson's Disease 6 years ago, I was particularly excited about the information on stem-cell research. The book was an easy read, not filled with scientific jargon that might leave a 'simple mind' searching for definitions. Well worth reading. I was very excited to read this book, but was somewhat disappointed. However, Arrison does make it easy for anyone who reads the book understand how we have the technology today to double our lifespan. But most of the book just shows the effect a longer life would have on our personal lives and society in general. Overall it was worth reading. This book was on a really interesting subject....but I found it really dry and hard to get through. Some of the scientific research was cool, but very dry to get through. Loved the chapters on family and money, it was really interesting to read how longer lives might affect us in that way. Overall, pretty boring but an interesting subject. I skimmed a lot of it. An interesting analysis of longevity and related technologies and issues. There were some pretty big assumptions made and leaps in logic. I think, if you read it with a critical mind with the aim to question and think about the topics raised more than to learn real facts, then it's worthwhile. First few chapters the author talked about the advances and new thinking and strategies of longevity research. Then she spent the next two thirds of the book speculating on the societal ramifications of many old old people. Great. Second part a little confused. Enjoyable book but I would love to have read a bit more content as to how longevity will occur.